Rosacea is a complex disorder that has multiple subtypes, dozens of symptoms and countless triggers. Every single rosacea case is unique and must be addressed as such. Dermatologists have been assigned to treat our disorder because rosacea is classified as an inflammatory skin disorder. However, rosacea is much more: it involves dysfunctional blood vessels, nerves, hormones and the immune system. Dermatologists need our help, feedback, input and specific case details to design the best treatment protocol. Rosacea sufferers who take a few minutes to organize specifics about their disorder will receive a more thorough evaluation and treatment. Just as important, your effort in building a Q & A list, as well as documenting your symptoms and triggers, signals to the physician that rosacea is not only affecting your quality of life, but also shows how serious you are about treating the disorder in a proactive way. It will also quickly help you see if that particular physician is right for you. Why is that? Well, if they just want to fit you into the standard treatment box, without being open to discussing your specific triggers and symptoms, possible integrated treatment approaches and any address any concerns you may have, it is likely time to find a new physician. Lets be honest…going to the doctor is stressful. As a result, we often forget to mention or disclose information that may be useful for our physician to help manage and treat our rosacea, or any other medical condition for that matter. For this reason, it is vital that you are prepared with key facts and questions to ask about your rosacea before you go to the dermatologist. We all have experienced the “Oh, I forgot to tell him about, or mention that I, or that this happens when” shortly after leaving the office. A little pre-visit preparation helps to minimize your stress and of equal importance, also helps you focus your appointment on you and your unique “rosacea” story. So please use the list below to guide you in this critical step. Taking time to write down the information that you will bring to your appointment will not only help your physician better treat your rosacea, but also ensure you don’t omit any pertinent facts during your visit. Put together a one page list of all your rosacea symptoms and triggers. This is one of the most helpful things you can do for your physician. Organize a list and put them in an order from mild to severe with a “severity” ranking. 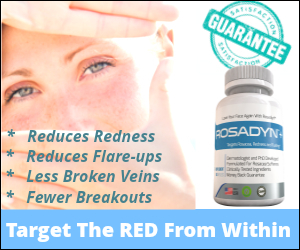 This will help the physician focus on your most important rosacea symptoms and triggers. Don’t be shy in constructing this list. While common triggers, such as spicy foods, exercise, sunlight or alcohol may trigger a flush, there may be other triggers too, such as an intimate or social situation that causes a rosacea flare-up. Also note your symptoms when you flush: Do you have a rapid heart rate? Get a headache? Get indigestion? Seem quicker to loose your temper? Get thirsty all the time? etc. Make sure to tell your medical practitioner these symptoms too. Symptoms may be less obvious but, they are just as important in helping guide your physician to a educated diagnosis. Basically, by having a “rosacea trigger & symptoms list,” you will help your physician understand what your trigger points are. Of equal importance, it will alert your doctor to any areas that require further investigation, as sometimes certain disorders display rosacea-like symptoms (but are not rosacea) or you may have an unrelated condition that is further aggravating your rosacea. Neurogenic Rosacea is a new rosacea subtype according to the National Rosacea Society. Very few doctors know about painful burning and stinging sensations that rosacea sufferers must battle through on a daily basis. Discuss these sensations in depth and point them to the “Rosacea Classification System” on the National Rosacea Society website for them to learn more about this often overlooked part of rosacea. There are treatments available for this rosacea subtype, but it takes trial and error in most cases to find the right protocols. A key tip: pictures are worth a thousand words! Take digital photos of your flushing reactions, break outs and superficial symptoms. Most physicians tell patients to simply “avoid all their triggers for flushing and rosacea flares” without understanding what they are asking patients to avoid. For many moderate-to-severe rosacea sufferers, this advice can affect every aspect of their professional and social lives. This is unacceptable advice to rosacea sufferers. It helps to show physicians active bouts of flushing, how easily they occur, how long they last, and how they effect daily life. Only then will they collaborate with other physicians, such as Neurologists and Endocrinologists, to determine treatment protocols for rosacea triggers. Take high resolution photos of your flushing reaction intensity, duration and rosacea symptoms that show up the following day to ensure an aggressive, but safe, treatment protocol for these triggers. Many of these can be treated or reduced significantly, provided your physician knows exactly what they are targeting (hence the importance of photos). Skin care aisles at pharmacies and grocery stores can be dangerous places for rosacea sufferers. Most skin care products are not made for rosacea-sensitive skin and WILL WORSEN most rosacea symptoms. Anti- aging, “sensitive skin care lines”, organic or natural, scrubs and masks are rosacea irritating suspects. Facial cleansers with salicylic acid, glycolic acid, lactic acid, scrubbers (eg polyethelene beads); toners with or without alcohol; moisturizers with harsh irritants like Retinol and even most “sensitive skin care lines” are not suited for rosacea skin. Topical irritants are the most common cause of increased redness, skin inflammation, flushing and acne rosacea breakouts. So please note any and all skin care products you may be using on your skin, including make up. Discuss previous use of topical steroids with your doctor. Many physicians are guilty of prescribing topical steroids to treat facial redness, skin inflammation and flushing. They work by constricting blood vessels — and work well for a short time — however, they make rosacea much worse if used for more than a few days or chronically. Over the counter and prescription steroids have long lasting effects on rosacea that are often hard to treat or reverse. Discuss any plastic surgery you’ve had in the past. Facial plastic surgery and medical spa treatments are common triggers for rosacea. In general, chemical peels, dermabrasion, and surgery to the nose, cheek bone or chin can cause severe rosacea reactions. A “Spa” day often comes back to haunt rosacea sufferers. There is no such thing as a rosacea-friendly facial…no one can predict who will react adversely to these types of treatments. Although it is rare, underlying disorders that cause flushing can be strong triggers for rosacea progression. It is vital, especially if you have other physical symptoms not common to rosacea, to rule out any of the disorders listed below. Also, you should alert your doctor if you are undergoing treatment for any other underlying medical conditions, as they may be contributing to your rosacea symptoms, triggers and breakouts. Be proactive and prepared when seeking rosacea care. Rosacea sufferers must take a proactive approach to improving their chances at rosacea symptom clearance and trigger reduction. Creating the above checklist is a key step in that direction, as is realizing that rosacea is much more than a superficial or “cosmetic disorder.” Armed with your list and the suggested photos, you stand an excellent chance of conveying your unique rosacea symptoms and triggers to your medical practitioner and thereby help them most effectively treat your rosacea. Unfortunately, there is NO CURE FOR ROSACEA. However, you can minimize, manage and possibly even halt rosacea progression, as well as repair its damage, with a comprehensive, integrated approach. This means communicating with your medical professional and working together to find the right blend of rosacea treatments that work for you and your rosacea subtype. This blend can include traditional medical treatments and procedures, lifestyle, diet, supplements, skincare and stress management. Remember: The first step to finding a effective rosacea treatment regimen what works for you … is you! Thank you for your question Michelle. In regards to your question: there really is no definitive test for rosacea. But there are a lot of combined symptoms, skin types and reactions that do help lead to that conclusion or diagnosis. Most rosacea suffers have had signs for a long time even from childhood. So, your physician considered your history and skin which is how they arrived at that conclusion. FYI rosacea symptoms can appear in areas other than the face like your scalp too. Itching means inflammation which can cause of hair loss. We do how ever recommend that you ask your doctor about your itching and hair loss especially because it sounds like this is atypical, new concerning symptom for you. Why? Hair loss can be caused by multiple issues from, seasonal dryness, medications, stress, rosacea or another underlying condition. Remember make a list of questions and symptoms to take with you so you don’t forget to ask and discuss those concerns with your doctor. Regarding your rosacea, great that you are living a healthy lifestyle, this will help you with not only rosacea but your all over health too.